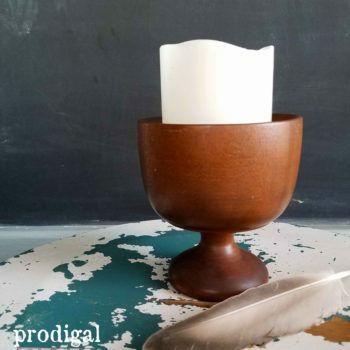 Maybe you don’t know this, but all sorts of furniture enters my shop, and most often gets a makeover of some sort, but I rarely have time to make a blog post for each one. This particular piece is a favorite of mine because of its gorgeous stature. Enter in this trifold vanity (or dressing table) found at a local garage sale for $40 with this chest of drawers and this dresser. It wasn’t in too bad of shape structurally and was only missing a matching bench. I found the one pictured here at another garage sale for $3. I love a good find! (tee hee hee) The top had been worn pretty good with chemical stains, but was no major damage to note that couldn’t be repaired with a little wood putty and sanding. The bench I found was a little wobbly and a bit of glue was all it needed to give it new life. 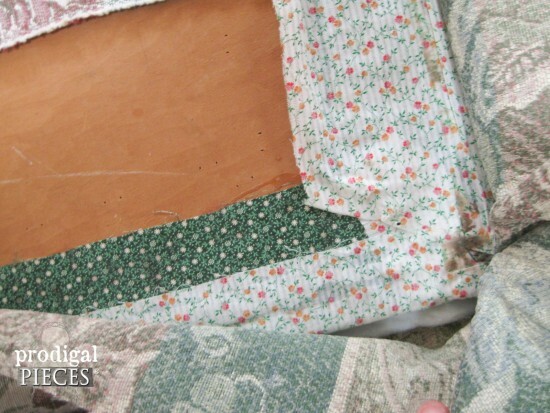 But, first I needed to take off all those layers of upholstery. I always like to ask my kids which one is there favorite…how about you? After a coat of stain blocking primer I used my favorite antique white paint. To accentuate those details that I loved, I added some accents of Modern Masters Warm Silver Metallic Paint and Folk Art Pearlescent White. Once the painting and hand-rubbed wax topcoat was done, I added new upholstery to the bench. I found this remnant piece in the clearance bin at JoAnn’s and have used it several times…it’s sooo gorgeous!! It reminds me of the summertime Queen Anne’s Lace flower. Are you ready?? Here she is all dolled up and ready to go. Those details make me swoon! Must find one for me…a girl can dream, right? 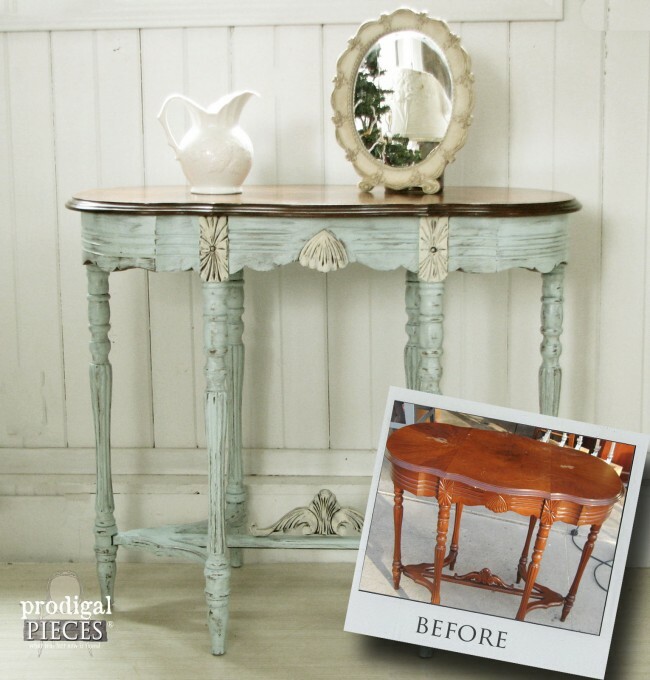 Do pin and share to inspire others to look past wear and tear too. This trifold vanity was meant to shine. Don’t forget to stop by my shop to see the latest additions! 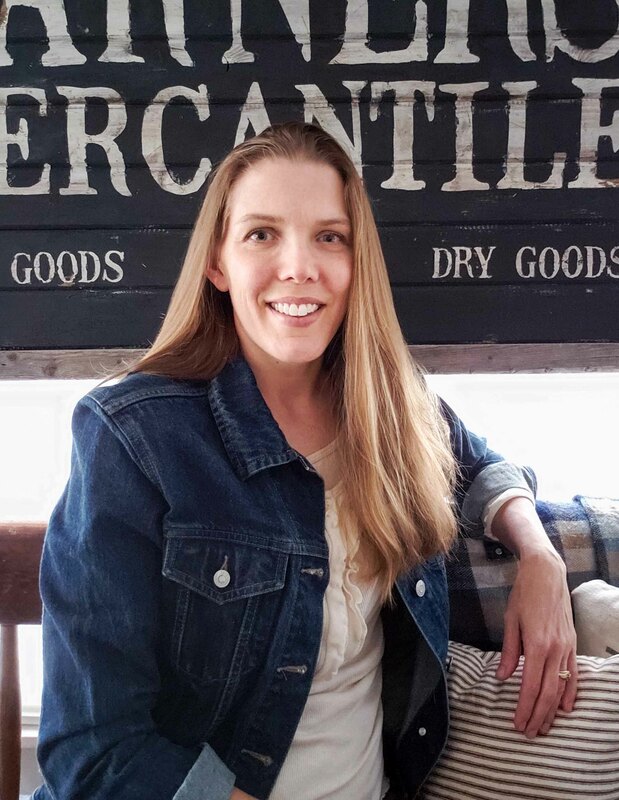 AND…Be sure to sign up for my newsletter to get updated in your inbox, and get your FREE Furniture Buying Checklist and special discount to my shop. Until next time! Yes, a fun find for sure! I was so excited to get to work on another tri-fold mirror vanity. Thank you for your kind words! 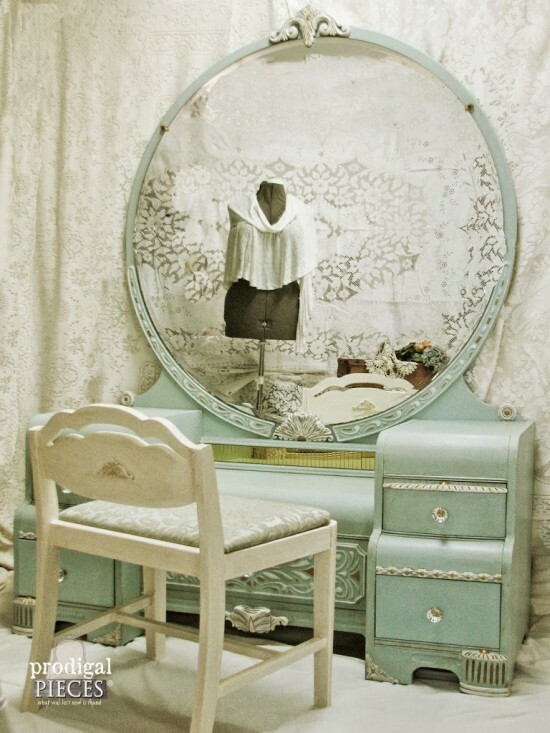 I have always dreamed of owning a vanity like this. I have yet to find one especially like the after shot. Love love. If you sell your pieces, please let me know pricing. Thanks!! Did you use stain remover necessary? before the primer…I have a similar piece i want to do like this. I had to use a bit of Kilz stain bocker, but other than that, it was good to go. Do you think you could transform to a bathroom vanity with a sink? Probably. It would depend on your plumbing setup. How much is that trifold vanity really worth? Looks stunning! Wish I could find a piece this beautiful to transform! Love this piece! 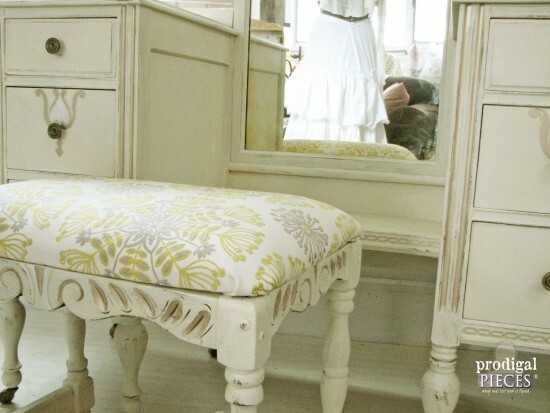 The layers of fabric on the bench sure tell a story! Beautiful makeover Larissa. 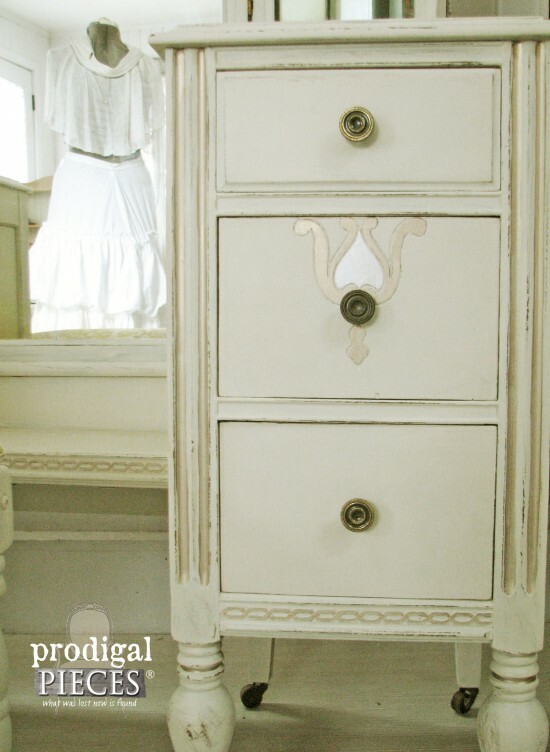 I like your idea of adding metallic paint to the details instead of dark wax – perfect for a vanity. I would imagine it’ll be hard to let this one go because it would look so good in your new master bedroom. coukd you please share what brand of hand-rubbed wax you used for this piece??? thank you so much!! Absolutely gorgeous!!! Certainly, Cindy. 🙂 For now I’m using my Minwax Paste wax, which works well, but I’ll be making my own when I run out. Wow. This turned out gorgeous. I love how it is feminine but in an understated way. I could easily fit it into my bedroom decor without my husband cringing. Great job! Wow, thanks for the inspiration! I just found a similar one, unfortunately, without the stool. Those are hard to come by, and I grab them when I can. You still got a gem! LOVE, LOVE, LOVE this. Seriously did NOT ruin it!!! Thanks for the love, Lynn! I love the color you chose, yellow and grey is a soft accent with this piece. Just beautiful!!! 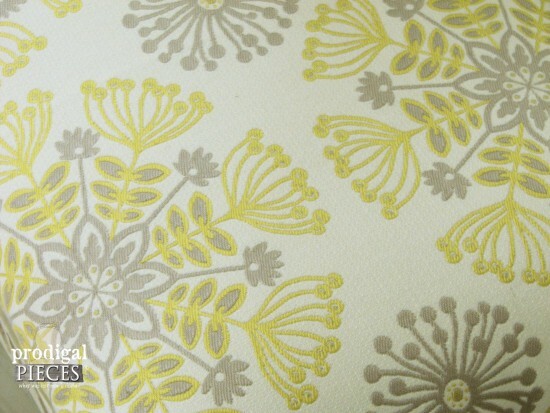 The fabric reminded me of Queen Anne’s lace…so sweet. Thank you! Beyond beautiful! You did a great job. 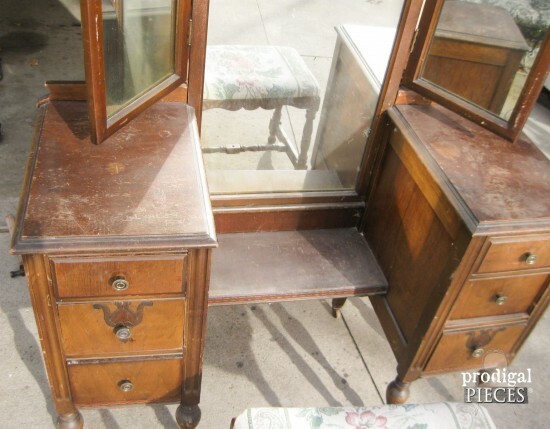 I have addiction to trifold vanities…so fun! Absolutely gorgeous! I love what you do! Thank you so much, Linda! It was a beauty in the making. The vanity is a beautiful piece. If I found it myself, I would have taken it to a refinisher and had him refinish it to it’s a original state. I think the vanity is nice in white too but just love wood better. This is beautiful! Great choice in colors! Larissa, please don’t give those negative comments any thought. All you can say is, “bless their heart!” Keep on doing what you are doing. No worries…already deleted on Pinterest and in my brain. Just bugs me people are thoughtless at times. Thank you! As much as I love wood, painting this piece has brought out it’s charm. I haven’t seen anything you have done that I didn’t like. Keep your heart filled with the good messages and just pass on the bad. Well I just love it. It’s a beautiful piece before and after you just gave it some character by softening the edges. Great job.! Thank you, Leslie. It had staining from some sort of spill to the top surface and they were killer to hide, but I’m pleased with how it came out and so is the new owner. Now that is absolutely spot-on!! A new family heirloom for some lucky gal!! Thank you, Mary Lea. Yes, the new owner bought it for her daughter and they are all delighted. Beautiful! I am just getting into refinishing and repurposing furniture as a business. I’ve done several pieces for myself and some for family over the years, but I have never done any to sell. I have searched the Web for days on end looking for this kind of deal and so far, everything is way too expensive. I can’t count how many times I’ve seen where a blogger or another individual who has posted their work on gorgeous pieces that they had found at a steal, such as you have here. I’m really starting to wonder, do you (and others) spend hours and hours searching for that super deal, like I do? I realize that once you’ve been doing it for a good amount of time, you establish a network and you have found the best local people and places to find pieces. But, what was it like for you when you first started? Can you possibly give me a few tips and advice for getting started? If you prefer to email me, or if any of your readers would like to share your experience with me, I would love that! I have the drive, and the passion to pursue this, but I feel like I have so much to learn from others who have been at it longer. I’m sorry this has turned into a novel, and I certainly don’t want to take away from the focus of your post. Please feel free to remove it if this is not the place. But, I would love to hear about your journey. My email is lddumaual@gmail.com. I’d love to chat with you, Lisa. Sometimes, it’s a hunt, but often they find me. 😀 I tend to make “rounds” and sometimes there’s a piece to be found and sometimes not. Lately, I only look when I need to. After having a stash for so long, I am finding less happiness in the clutter and feel pressure to go, go, go. Now, I only bring home what I’m going to work on and accept free or super-stupid-to-pass-up deals. 😀 Craigslist is a wealth of possibilites if you have the time to check every day. Hope this helps! Looks a 1000 times better! Beautiful!!! Let the haters hate. Amen. Thanks for the love, Zona! Gorgeous! Love it!! Paint was a great choice! That’s awesome to hear. Thank you, Lory! So lovely. I am sorry someone was thoughtless and unkind…clearly a wood purist. Sometimes, I too, prefer wood but that is not always the possible path. You made this old girl pretty again. Good job! Thanks for the love, Terri. 🙂 Funny thing is most of my own personal furniture is in a time-worn state and I rarely paint unless need to. This vanity needed a refreshing in order to sell, which it did. The new owner loves it and that’s what counts. I just let that one person get under my skin that day. Ah well…on to the next piece! I love the after. You gave a new life into a tired looking piece. It can go on now and bring joy to whom ever purchases it. So subtle and tasteful in every way! Love the little touches you do! Thank you, Kim! I have fun doing what I do and am blessed. 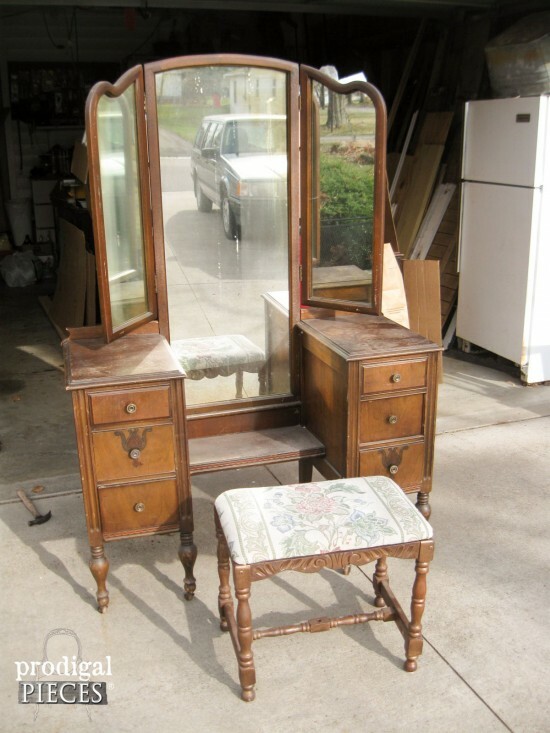 I have the trip fold mirror vanity that my great grandmother gave to me when I was a very tiny little girl…. it’s been stored in this shed and that shed over the years, until now…. I pulled it out over the weekend and plan to give it, it’s much needed and deserved transformation. I don’t even care that I don’t have room for it…. I have wanted to do it for years… something else will have to go to make room for it, it has a right to be displayed in the home… ha ha ha ha! I can’t wait and I hope mine looks at least half as good as yours when I am done!!! 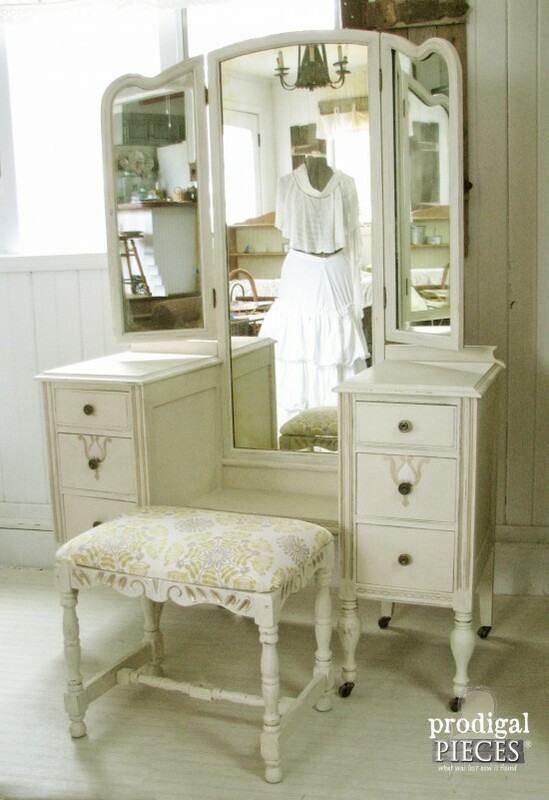 Larissa, I have the EXACT same dressing table it was my grandmothers and am going to do the same antique white — I want to send you a picture of it and some other of her pieces to see if you have any ideas, could I do that? I am a beginner so wish me luck! 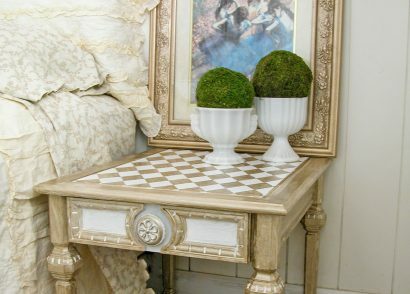 Are these pieces for sale? 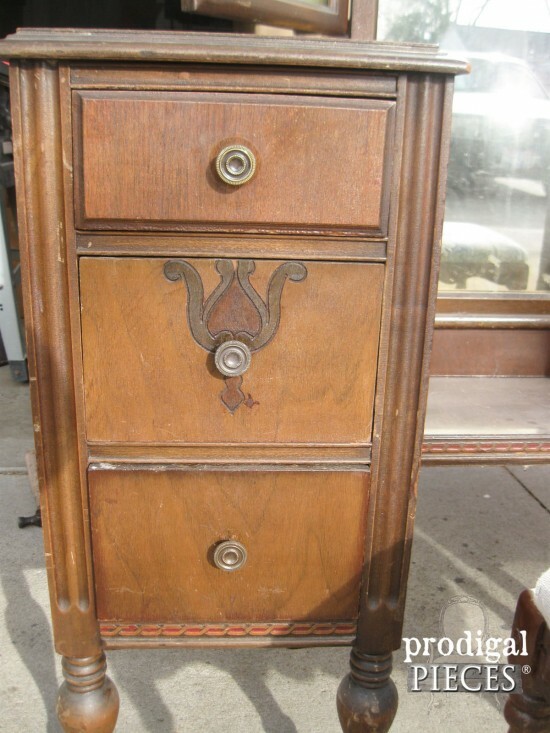 I’m trying to locate at least 6 vintage vanities. They don’t have to be oversized but a decent size would be nice. Please contact me if anyone happens to spot one for $500 or less. I live in Missouri and would need to have the item shipped. I don’t necessarily need the bench but it would be nice to have. I personally like the original wood but the restorations look nice also. Hi Tamia! 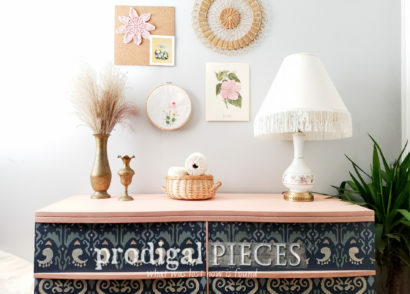 Could you email me at larissa@prodigalpieces.com and we can “talk”. Thanks! I got your email, Melissa, and will respond when I can. Thanks! Larissa- I just ran across your site because I am looking to paint my daughter’s cherry wood transitional crib white for her full size bed. 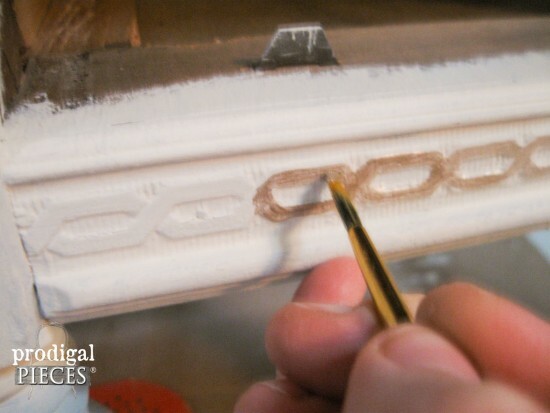 Did you sand this piece before painting? My crib is in good condition (without many nicks or scratches. I read you painted it with stain block primer and then your paint. Is that all you needed to do? Sorry, I am very new at this! Your vanity turned out beautiful! Hi Larissa, I have a piece just like this. It was my grandmothers, so it is a definite antique. It’s a darker cherry wood right now. My question is, does it take away from the authenticity of being an antique by altering the color? I don’t plan on selling it at all, so I guess changing it should not matter. I really love what you did, making it white and I’m thinking I might go that way! Love all your finds and creativity! If it is in good condition you can devalue it by painting. You could always check with a local antique dealer to make sure. Otherwise, it’s yours and do what you want that makes your heart happy. 😉 Thank you for the love! You do such beautiful work ! 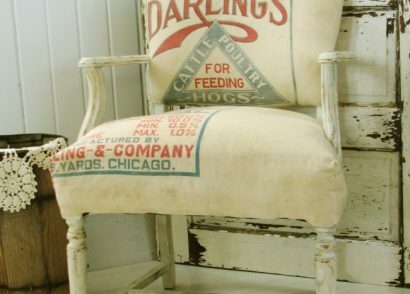 You mention you use your favorite antique white paint. Would you tell us what it is ? I will paint a bedśide table and chest soon and I have been looking at paint chips. Goodness, seems like there’s hundreds to choose from. I have bright white ceiling and Revere Pewter on new sheetrocked walls in our bedroom with white trim on doors and windows. Hello. Did you do anything with the mirror? I bought a vintage vanity and the mirror has dark spots and streaks that can’t seem to go away with anything I’ve been using. Any help would be appreciated! And well done on this transformation!